As luck would have it I am doing the above on two blogs this week. You have several overall messages in this book — I like the one that we do not need to become Amish to use their business principles. Do you think this is true in other aspects of life as well? You can enter to win a copy of my book and read the interview at Saloma’s blog. The contest runs til this Friday Feb 10. 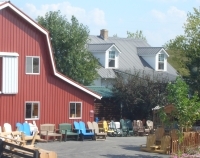 Can you share one of your favorite Amish small business stories? One of the most inspiring for me personally is one harness maker who is partially paralyzed. He moves around with extreme difficulty, sort of a shuffle around his shop. He just has a small business, but one that has reached customers across the country. His attitude is about the best you will find. There is such a warm gratitude there when he speaks—for his customers, for the opportunity God has given him—that it really makes you take a look at your own situation and realize your blessings. Thanks to both Karen and Saloma for the chance to talk a little more about Amish entrepreneurs. A great topic and looks like a great book! Richard you do hear about family involved in business going both ways–good and bad. I do think the Amish mostly make it work, there is a respect for seniority and hierarchy in Amish society that probably helps. That said there are some very capable younger people as well. Yes Erik, I believe that being more like the Amish can benefit us in our business dealings and also in other aspects of our lives. I think my Amish friends have been a good influence on me in many ways: being more humble, judging others less, working harder, having more faith that God knows what is best for us, even when it is difficult for us to see. My Amish friends have been a good influence on me in similar ways Margie. I would love to read your book, Erik, I tried to post a comment to Saloma’s blog, I’ll check later to see if it was posted. Your subject sounds really interesting, if I don’t win I will want to read it….intriguing subject…! Thanks Kim! It was fun to revisit the book which I haven’t done here in awhile. Amish businesses are one of my favorite topics as you probably guess from the number of posts on that topic. I was blessed to receive Erik’s book last year and it is wonderful. As a small business owner I found it very invaluable. Many things I already knew and practiced in my own business but I also learned a great deal. Anyone who wins the book will be blessed, but especially those who are either in business or looking to start their own small business. The values the Amish hold dear are those which should be found in any small business owner and even in every day working class people. Good luck on this latest contest! Thank you Alice, very kind 🙂 BTW you have some great ceramics from what I have seen on FB. I read your blog everyday. I would love to win a copy of your book Success Made Simple. Thanks for the contest and all that you do!!! Above is a link to the KY bill that would allow the SMV triangle requirements to also include reflective tape to satisfy the requirement, it seems to be doing well, and there are a few updates to the bill that can be seen at the above link. I own and have read Erik’s book. Very educational. potential customers who require contractor’s insurance. A few days ago I found a 40 squares roofing job (removing the shingles on the roof and replacing them with new architectural shingles)for my Old Order Amish friends. A quote was submitted which the homeowner found acceptable. However, the homeowner wants proof of contractor’s insurance. Thank you George. There are liability plans self-organized within Amish communities and managed by Amish in cases of customers making claims. They do this in Lancaster for example. In some cases Amish may actually pick up commercial liability insurance however. I don’t know what community your friends are with, and if they’re more conservative it may be prove to be a roadblock. Good question George V. I never let anyone step on my property to do work without proof of insurance. I bought two of Erik’s book, one to read and the other to donate the the library where my daughter works. I suggest all of you do the same. Read one and donate the other. Hey, Erik, any chance you’ll release your second book as an ebook on Amazon, so we don’t have to wait so long? I’m ready to read it! How do you enter into the drawing for your book, Erik? I’m very interested in it, I’m expanding my flock of chickens into a small business and live in an Amish and Mennonite area, and would covet reading your book! Thank you! Sure thing Brie, all you need to do is go over to Saloma’s blog (first link in the post above) and leave a comment on the interview post. And my best to the chickens~!